The IBM Global CEO study found today’s business leaders rank technology as the most important external force that will impact their organizations. 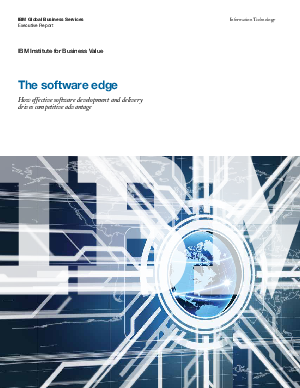 A 2013 Institute for Business Value (IBV) software development study supports this, with IT and business leaders identifying five top technology trends critical to competitiveness. However, the same survey reveals that most organizations are not prepared to take advantage of these trends. While management recognizes that software is crucial to capitalizing on technology for competitiveness, they are not successfully executing.